Cairo, 12 Nov. 2018: – The African Export-Import Bank (Afreximbank) today in Cairo signed an agreement granting an EUR 30 million revolving trade financing facility to Caisse des Dépôts et Consignations du Gabon (CDC Gabon) to support the operations of the tenants of the Gabon Special Economic Zone and to provide them with the capacity to export their products. 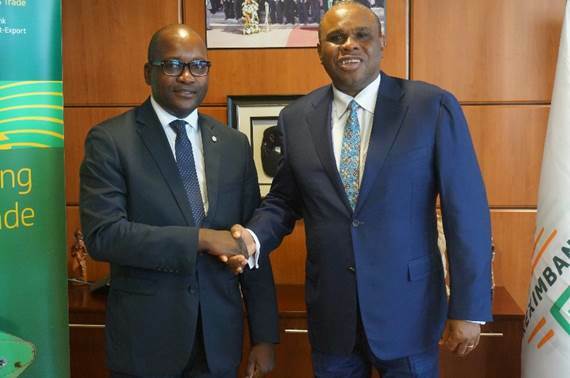 “This collaboration opens the potential for our two institutions to strengthen our relationship and mutual cooperation in order to make significant contributions towards unlocking the full potentials of industrial parks and export processing zones and delivering the much-needed developmental impact on our continent,” said President Oramah. Responding, Herman Nzoundo BigNoumba, CEO of CDC Gabon, said that the facility would reinforce Gabon’s capacity in wood processing by making it possible to achieve first and second level processing, thereby moving the country beyond merely being a logging nation. It would also support the government’s policy aimed at changing the way wood was treated in the country, added Mr. BigNoumba.